Your car has served you well. It has gotten you through the cold winters, navigating snow-covered roads and delivering you safely to your destination. Your car has gotten you to family vacations and not left you sweltering in the summer heat. Isn’t it time you rewarded your car, and yourself, by getting it detailed in the best auto detailing place in the area? We do! When you bring your Vernon car into our shop we go over it thoroughly, making sure we don’t miss even the smallest imperfection. Whether you are concerned about mud on your pickup truck, the dent in your car fender or the failing lights on your SUV we have you covered. We love bringing out the beauty in classic cars. When you bring your vehicle to us, we treat it and you as the individual you are. By the time you leave, you will know how special we believe each of our customers is. The detailing your car receives will make you feel like you are driving it off the showroom floor and not a detailing shop. Whether you need only a thorough washing or your car needs scratches and dents repaired, we have you covered. Our experienced team maintains the same dedication to its work that earned Mike Fuda his excellent reputation. *Our interior detailers specialize in removing dirt, grime, and stains from every nook and cranny of your vehicle. *Our exterior detailers are specially trained in wet sanding, buffing, and vehicle prep in order to remove scratches, paint defects, contamination, and imperfections. *Our express detailers can provide you with the maintenance you need to keep your vehicle looking showroom in between services. Our customers are what keeps us going and we want you to be one of them. We guarantee we will work with you until you are completely satisfied with the job we do. 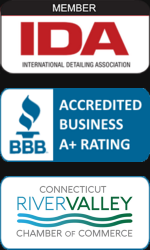 We have served Glastonbury, Connecticut, and the surrounding areas for over 20 years. When you are ready to transform the look of your car, give us a call at (860) 430-1189 or email us at mike@p5c.300.myftpupload.com to set up an appointment.